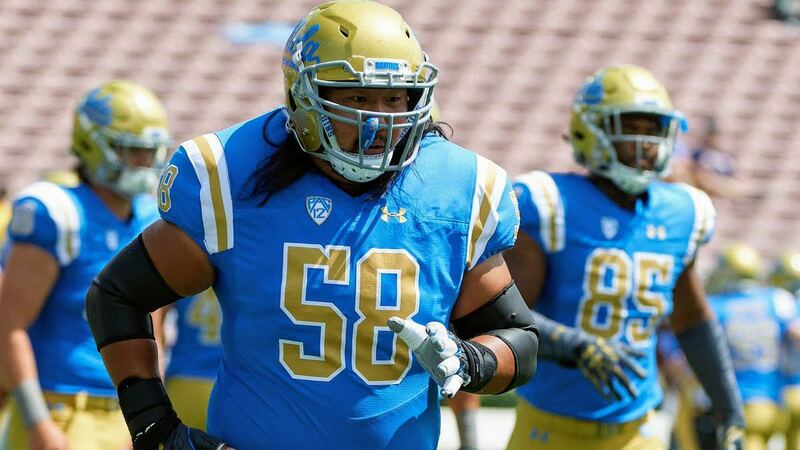 In 2016, OL Gyo Shojima (@gyoshojima) became the first #Japanese born player of full Japanese heritage to play for a Power Five program when he suited up for @UCLAFootball. He will earn that same honor next month in Miami when he attends #TSLShowcase! LOS ANGELES – All eyes were on quarterback Josh Rosen, a potential top-three pick in this month’s NFL Draft, during UCLA’s pro day on a mild, sunny day in Los Angeles last month. Gyo Shojima might have been the most unlikely person there, but that was of no concern to the Japanese player. Regardless of what others might have thought, his just-do-what-I-have-to-do mentality never wavered. The Tokyo-born player was one of many who showed up to showcase their potential and skills to NFL coaches, scouts and officials. The 24-year-old, who played as a backup center and on special teams the last two seasons for the Bruins, is a serious, humble man who chooses his words carefully. When he arrived at UCLA in the fall of 2015, after playing two years at Santa Monica College, he said he wanted to concentrate on the Pacific-12 Conference team, not saying too much about his post-college career. But now, with his stint on the team having ended and his graduation coming in June, Shojima hopes to keep putting on a helmet and pads — this time on the NFL gridiron. Shojima said he has “always had aspirations to go to the next level” after his collegiate career, although he carefully thought it over and considered “a different course in life.” (He’s majoring in geography and environmental studies and has been on the honors list in the last six quarters with a 3.577 GPA. So he would certainly have other job options outside of football). “So I didn’t want to waste it and I took a shot,” said Shojima, who moved to Redondo Beach, in the Los Angeles area, when he was 9, because of his father’s business. Shojima believes he gave a good performance at the pro day. But when it comes to the possibility of making a 53-man NFL roster, he again chose his words carefully. “I don’t think it is for me to decide,” Shojima said. “All I can do is just work on what I can work on and prepare myself to be the best player that I can be. And if all things click and if all the pieces come together, I will continue to be optimistic. Shojima looks set to get invited to a rookie mini camp and then a preseason training camp as an undrafted rookie free agent, which some of the great NFL centers in the league of late and in the past, have done. The Japanese mentioned one of his favorite players is Shaun O’Hara, who helped the New York Giants win Super Bowl XLII as their starting center, having entered the league with the Cleveland Browns as an undrafted rookie in 2000. Next TSL Alum WR Joe Anderson signs with Montreal Alouettes of CFL!